It was pretty cool to see the Washington Capitals win the 2018 Stanley Cup. To top things off they won the cup in the city of Las Vegas (the first major professional sports team to win a championship in Vegas). While I am not a Capitals fan, I do like the team and was happy to see them finally win it all. 8 wins in their first NHL season to the great 8, Alex Ovechkin leading them to their first Stanley Cup in 2018. Eight is definitely a magical number in DC. The Washington Capitals entered the NHL in 1974. Those early Caps teams where terrible. However in recent years (thanks in part to Alexander Ovechkin), the Caps have been one of the strongest teams in the regular season. That success however, has not translated to much in the playoffs… that is until this season. Here is a look at some of the all-time team statistics for the Washington Capitals. the Capitals have an all-time Wins-Loss record of 1,575 wins, 1,406 losses and 303 times in 3,426 career regular season NHL campaigns. As many hockey fans can attest, seeing the raw emotion of Alex Ovechkin finally win the Stanley Cup was really cool. It truly was something special. His interview on Hockey Night in Canada was pretty entertaining as well. This guy is passionate. TJ Oshie is a favourite player of mine and we loved his post game interview with Scott Oake from Hockey Night in Canada. This was the best post game interview for our money. Congratulations TJ Oshie. There are so many good stories on this team this year. How can you not be happy for this franchise? Head coach Barry Trotz was told in 1982 by the Washington Capitals that he would never play in the NHL, but he might be a good coach. In his four years at the helm, Trotz has averaged 51.25 regular season wins per season. He is the only head coach in Capitals franchise history to lead the team to a Stanley Cup championship well done. So another year in the books. Finally the Washington Capitals have won the Stanley Cup. Great job boys! This team was a team that truly came together in the playoffs this Spring. For every little hockey playing kid in Canada, the United States and around the world, we have all dreamed of hoisting the Stanley Cup above our heads. Alex Ovechkin and friends finally got the job done. 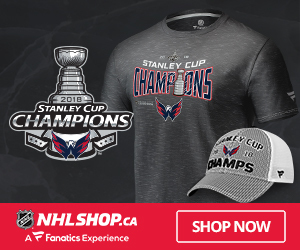 After 28 NHL Playoff appearances, the Washington Capitals are Stanley Cup Champions. Here’s a look at 43 seasons of the Washington Capitals.